The V. International Gregorian Festival presents eleven scholas from eight countries (Austria, Ireland, Japan, Hungary, Germany, Norway, Romania (Transylvania) and Slovakia) and three great lecturers. The festival is a unique and important occasion in the musical life of Central Europe as the lectures are going to be held by the most excellent professors who have specialized knowledge of Gregorian singing but who are not much known in Hungary. The most important events of the festival are the liturgical occasions where the essential spiritual message of the Gregorian songs is manifested. On these occasions the introductory songs, all the changing parts of the mass and the chants are performed by the invited scholas but everyone can join in the permanent parts (Kyrie, Sanctus, Agnus Dei). On Thursday and Sunday we are going to sing the IV. Gregorian mass and on Saturday, the IX Gregorian mass. 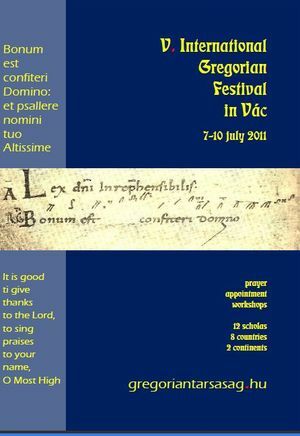 The music notes can be downloaded from the website of the Gregorian Association (www.gregoriantarsasag.hu, Saturday, www.gregoriantarsasag.hu, Sunday) or we can also send them on post if it is required. On the concerts the audience can hear Gregorian interpretations of excellent foreign scholas which are more experienced than the home scholas. Beside the lectures and concerts, there will also be exhibitions of the fine arts on the festival. The festival also aims at giving inspection into the researches on Gregorian which have been going on in Western Europe recently. The Gregorian Association has invited respected professors who are going to give their lectures on this topic. On Saturday several Hungarian and foreign scholas are going to introduce themselves. That day codex-copying and badge-making workshops are also going to run. Hungary Cantate et Jubilate Schola (Budapest) - Ferenc Sapszon jun.